In this post, the screenshots are from PSP. But strategies are applicable to PC and Consoles. After my first 12 games on Top difficulty, I am quite impressed that I am in 2nd place, managing to defeat Liverpool and Chelsea, while losing to Man Utd. Not too great, but provides a challenge. 2 pointers about Everton in PES 2010. 1. Everton has very few defenders. 2. Everton has MANY strikers! Just take a look! Sell most of the young strikers. Sign Baxter if you are from another club. 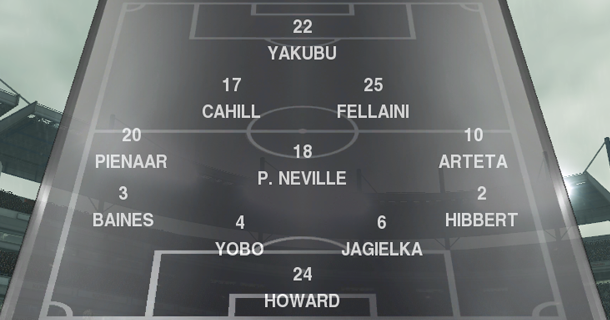 PES 2010 Everton uses a 4-5-1 formation, a suitable formation considering the players they have. Fellaini in CM as he is very tall and strong. Helps win headers and tackles in the middle. Arteta In Central AMF as due to special ability as a ‘Central Player’. CFs: Yakubu or Saha. Yakubu is Right Legged, Saha is Left-legged. Can switch to 4-4-2 to utilise both of them. Use Jo only when necessary. Groom young Baxter when possible. Phil Neville provide excellent defensive duties and attacking options. Fellaini win balls and possess great attacking talent. Arteta and Cahill have superb technical abilities. They have good ball control and shooting skills. Pienaar is a decent winger. Striker Yakubu has speed to outpace defenders, strong to challenge for headers. Use Joseph Yobo as an Attacking CB. In midfield, Osman is the only decent substitute. The rest of the squad are young and lacks real skill. Everton brings a new challenge, by using a mid-table team to fight for honours. Ensure you bring in sufficient back-up players to replace your stars when they grow in fatigue.